Starbucks for example, after launching this season’s red cup, sparked a week’s worth of dispute from consumers on social media. Some people were furious the cup wasn’t “Christmasy” enough. Others, mocked the issue and created memes to bring forth humor on the topic. Here are three important stats to help you decide which term your company should use during this season. Market research shows that only a very small percentage of people are actually offended by which term to use. 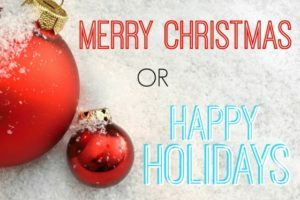 When asked about how stores should greet their customers over the holidays, 42% of Americans prefer “Merry Christmas,” 12% prefer “Happy Holidays” and 46% say it doesn’t matter. This data shows that you can easily can easily go either way. The company should focus on their brand, mission, and who their target market are to decide further what is best for them to use. When broken down regionally, we can see that the majority of individuals prefer “Merry Christmas”. 56% of Northeasterners, 57% of West Coasters, 70% in the Midwest, and in the South 69%. So, in deciding which way to go, your decision should be aligned with the way the rest of your company’s marketing is based. That is, the decision should be based on your target audience’s interests and be aligned with your brand instead of chasing the season’s zeitgeist. This means if your brand’s messaging is more traditional, maybe Merry Christmas is the way to go. However, if your brand skews younger and more diverse, then Happy Holidays might be a better fit. No matter which way you go, here’s hoping you have a prosperous Merry Happy Holiday! If your company wants more insight into this issue and others, contact the market research experts at ConneXion Research.